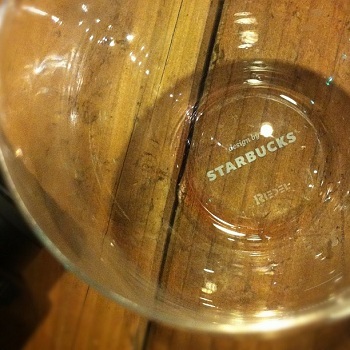 Starbucks is a coffee shop, so it was a surprise to me to learn that some of their locations are now serving wine in a program called Starbucks Evenings. As part of the program, these stores serve a variety of wines and small plates dishes after 4pm. 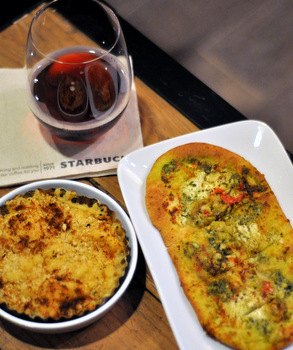 The idea is that many customers already come to Starbucks to relax and unwind with coffee, but that some people might like to have the option of getting a glass of wine and a snack (the full coffee menu is still available) instead of heading to a bar or a full restaurant in the evening. At the moment, there are only a handful of stores located in Seattle, Chicago, Atlanta, Portland and in Dulles Airport in Washington DC. There are also two stores in the LA area and one of them happens to be just a short drive away from me, so I decided to head over and check out the concept to see what it was like. At first, it looked like a normal Starbucks – until I noticed all the wine rack up where whole bean coffee bags are usually stored. The ordering process is just the same as with coffee drinks, where you order from the barista at the register and wait for someone to call your name to pick up your drink. The food takes a little more prep than the standard pastry case choices, so someone will bring any food you order over to your table when it is ready. 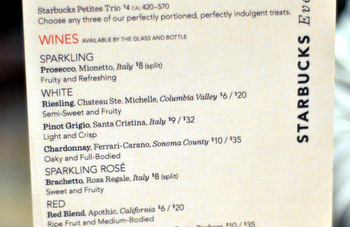 The wine selection is quite good, as you might imagine, since Starbucks could choose from just about any wines that they might have wanted for the menu. There is a little something for everyone on the menu, including reds, whites, one sparkling rose and one Prosecco. They were served in Designed-by-Starbucks Riedel wine glasses that were a huge jump up in quality from their usual white paper cups, too. The majority of the wines were from California and the prices ranged from $6 a glass for the least expensive wines to $15 a glass for the most expensive. Most leaned towards the lower end of the spectrum. They also offer several types of beer, served in nifty pint glasses, for $4-5 each. I took the recommendation of the barista and opted for the Rosa Regale Brachetto, a Sparkling Rose that was sweet and refreshing (I would definitely have it again). I felt that the pour on it was a touch smaller than I might expect to get at a wine bar, but not by much. 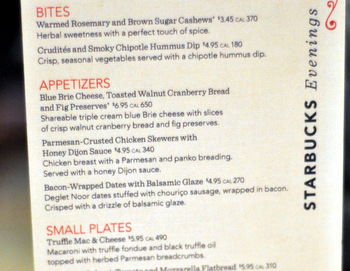 The menu was larger than I expected it to be, with snacks, appetizers and larger “small plate” options. 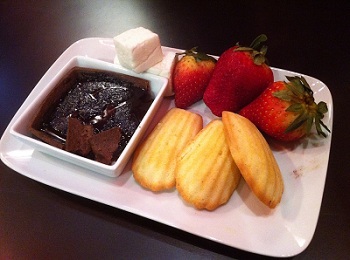 I wanted to sample a few items, so I tried the Truffle Mac & Cheese, an Artichoke and Goat Cheese Flatbread and the Chocolate Fondue dessert. The Mac & Cheese exceeded my expectations and was my favorite of the night. 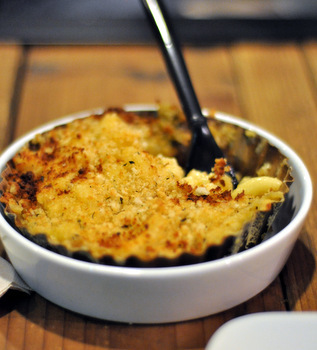 It hit the spot with a wonderfully creamy sauce and a crispy topping of breadcrumbs. You could definitely taste the truffle it in, too. 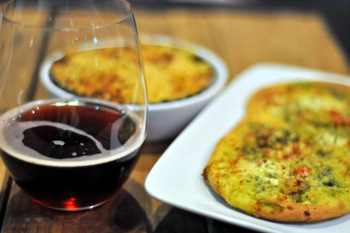 The flatbread was basically a small pizza, heated up in the convection oven until it was hot and the cheese was melted. This one had good flavor, but isn’t going to top something you could get at a place that specializes in pizza. I should note that you don’t need to buy wine to get any of the foods served as part of the Evenings menu. You can have those with your coffee, if you prefer, but you still won’t see them at stores that aren’t offering this program. Overall, I thought that this was a lot of fun and it was very novel to get something besides coffee (or tea) at Starbucks. This particular store – you can get a full list of stores with the program here – was huge and newly remodeled, so part of the atmosphere was how well designed this particular location was. It was also quieter than most restaurants and less crowded than most bars tend to be. I noticed quite a few other people in the store enjoying a glass of wine, so it just might be something that catches on, and I think that I would be very likely to go back to meet up for friends with a glass of wine the next time I’m looking to have a relaxing night out. I read about this a few days ago. I wish they did this where I lived. I hope it catches on! I’m in Woodland Hills so Agoura wouldn’t be too far. I wouldn’t spoil dinner at the Saddlepeak with it but something from LaPaz just down the road might be nice with this little aprÃ©s. Any hints how long this experiment may last? 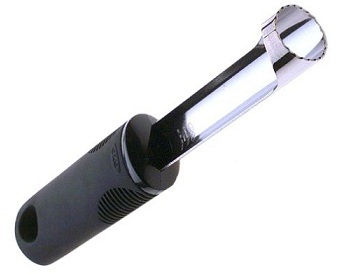 Rainey – I think it is going to be a permanent program, so you should have plenty of time to give it a try. I think that the test stores were in other markets, so if it doesn’t get too popular they probably just won’t expand to many other stores in the LA area. Some years ago I fell in love with an upscale adult-oriented pilot program Jack in the Box launched in Bakersfield. Leather chairs around a fireplace, wine available in small bottles, a more sophisticated menu but still priced closer to Jack in the Box and served quickly. I think they were called JB Grills. No one would have mistaken them for anything other than fast food but it was GOOD fast food in a much more pleasant atmosphere. Alas, they disappeared and I think Woodland Hills is an area where they could have done very well.